Garnet is a wonderfully preserved ghost town in Granite County, Montana. At one time it was a bustling mining community, filled with gold prospectors seeking their fortune. Today, only the buildings remain, although there is still some mining taking place in the surrounding hills. I had the pleasure of visiting Garnet in the spring of 2015. I was interested to see the town, and explore some of the surrounding country. 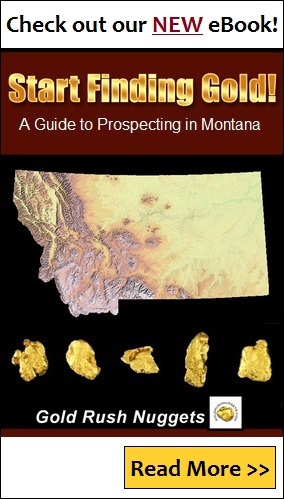 The first discovery of gold in the area was on Bear Creek, a tributary to the Clark Fork River about 30 miles east of Missoula. The town of Beartown sprang up at the confluence of Bear Creek and Deep Creek, a few miles south of present day Garnet. Rich placer gold deposits were worked all up and down Bear Creek and the old diggings are still clearly evident. On the drive up Bear Creek, I did notice at least two active placer mining operations. There was also a gravel pit at the mouth of Bear Creek that had a large trommel set-up amongst the old dredge tailings. Placer gold found in Bear Creek was often rough and with quartz attached, indicating that there were likely lode sources nearby. Mining of the placer deposits was dependent on available water that was only available during spring runoff (when I was there in late April, there was just a trickle of water in the creek). As the miners ventured upstream they soon found the lode sources. In 1895, the mining town of Garnet was established. Located at the head of First Chance Gulch below Anaconda Hill, a major gold vein was discovered at Nancy Hanks Mine and a stamp mill was built. More rich discoveries were soon made in the mountains surrounding Garnet. Rich gold veins continued to be discovered around the town, and an estimated population of around one thousand people lived in Garnet by 1898. During its heyday, there were 13 saloons, 3 hotels, several mercantiles, a barber shop, and various other businesses. Although it was rough and rowdy like most mining towns during those days, many of the miners also brought their families. There was a schoolhouse and many women and children in Garnet, and the town was known to have community activities like dances, hay rides, picnics, and other social activities. Garnets most well-known resident was a man named Frank A. Davey. He owned a general store, blacksmith shop, mining claim, the Garnet Stage Line and a hotel in town, and lived there until his death in 1947. Nearly all of the land that Garnet now sits on was on his lode claim, and after his death his heirs donated the land to the U.S. Government. The Bureau of Land Management now manages the Garnet ghost town, and it is a well-preserved look into the past. For a small fee (I believe they charged $3 to park), you can walk through the town exploring the various old buildings and relics. If you want to take a close look at all the building in town, you might want to bring a few bucks with you when you visit. As you would expect, you are not allowed to do any prospecting or metal detecting within the town site of Garnet itself, however I did see mining activity just a short distance outside of town. I expect the area is still heavily claimed in the richest areas. Large dredge tailing as you venture up Bear Creek on the way to Garnet. An active placer mining operation just below Garnet in First Chance Gulch. Lots of old buildings and interesting relics at the original Garnet town site. If your ever in western Montana, the Garnet ghost town is definitely worth a visit!